« The Road to Mech Warfare: Score! From the TRC: The MorpHex! WARNING: This post might make you think twice before you spin a globe violently or kick that unassuming ball down the street. By looking at the video, we’d say that the dream is a reality. In hexapod mode, the MorpHex elegantly traverses terrain – then, very subtly, it begins to constrict its size until it’s ready to transform. In sphere mode the MorpHex can roll, stop and even dance around. And while there are a million things to love about the MorpHex, the fact that the body was constructed out of a earth globe is the cherry on top. Zenta has entered the MorpHex into the Boca Bearing 2012 Innovation Competition and could win a $10,000 grant to further develop the MorpHex. We know who we’re voting for! Maybe one day we’ll see a whole army of MorpHexes rolling down the street! 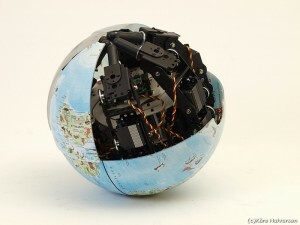 This entry was posted on Wednesday, April 11th, 2012 at 11:04 am	and is filed under Featured Projects / Robots, Front Page News. You can follow any responses to this entry through the RSS 2.0 feed. You can leave a response, or trackback from your own site.